With Works by Caroline Absher, Jeffrey Bishop, Ford Crull, Peggy Cyphers, Craig Dongoski, Valentina DuBasky, Sheila Elias, Jane Fire, Augustus Goertz, Richard Heinrich, Carter Hodgkin, Sol Lewitt, and Mark Tobey. 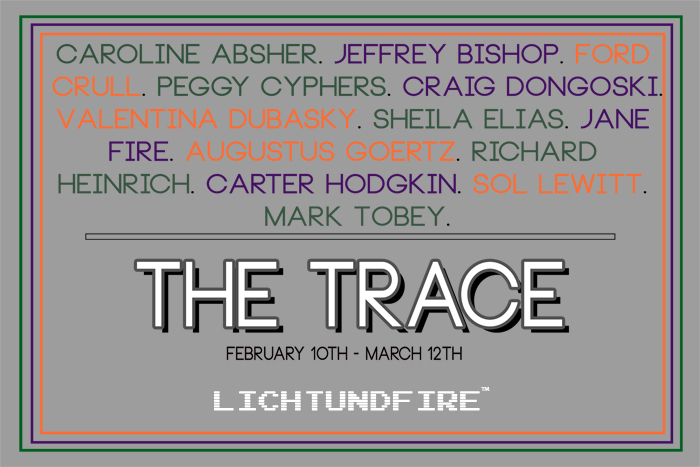 Lichtundfire is happy to announce THE TRACE, a group show comprised of Artists Working in Various Media Linked to Mark-Making. Inspired by the deconstructivist ideas of French writer, theoretician and cultural critic Jacques Derrida, this exhibition is based upon the principles of the absence of presence or, in reverse, the presence of absence. There is a realm beyond what can be seen with the bare eye, or to what the mind can fathom. French philosopher and literary critic Jacques Derrida uses the term trace in literary criticism, to describe the remnant of all non-present meanings, sounds, or written markings on the page– especially in the sense that features are identifiable only by the absence of other feature. The act of mark making in painting and drawing leaves behind its trace, the sign for everything elusive, the evidence of everything it is not, as a visible impression of the indeterminacy of space and thought impression. Both painting and poetry leave in their path clues that something has been present, a spark, a tag, in a just-barely detectable amount, a suggestion of quality. Can technology claim such a position? Can evolution into the ultimate heights of technological advancement, leave behind its trace? Painting and poetry embody that indeterminate meaning as space and thought. In their ambiguity, painting and poetry create new thought connections, reflecting unseen future histories and memory.